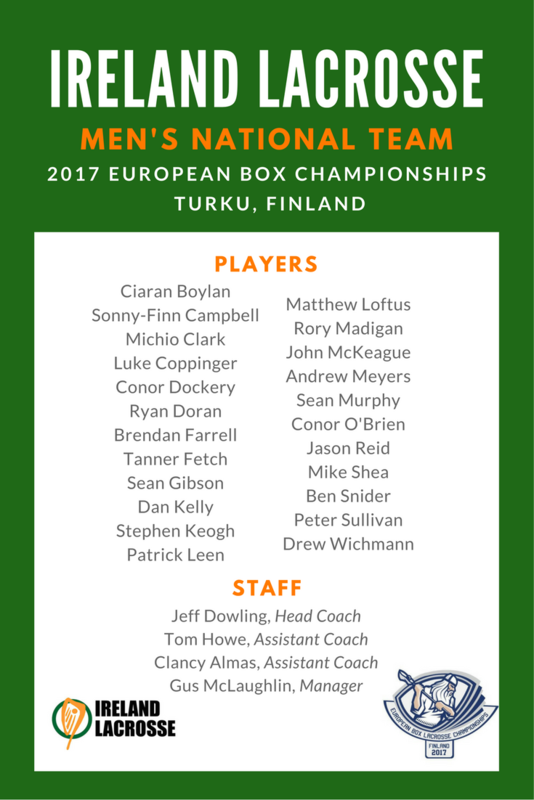 DUBLIN, IRELAND – Ireland Lacrosse has announced a 23-player roster for the Men’s Indoor National team, which is set to compete in the 2017 European Box Lacrosse Championships. This tournament is to be held in Turku, Finland from 8 – 15 July. The players named to the roster were selected after an intensive, three-day selection camp in Dublin. Additionally, the Executive Board of Ireland Lacrosse resigned the Men’s Indoor National Team head coach, Jeff Dowling. His staff consists of Assistants Tom Howe & Clancy Almas, and Equipment Manager Gus McLaughlin. Dowling & staff lead the Indoor National team to a 6th place finish at the 2015 World Indoor Championships. That campaign was hugely successful for the team, where it notched wins against Germany and Serbia, as well as Australia and the Czech Republic, both of which were ranked higher than the Irish team going into the tournament. Three players from the Irish team were selected to the FIL President’s Team. President’s Team honours are awarded to the most outstanding players in all divisions except the blue (top) division. These were Mike Cregan (Goaltender), Stephen Keogh (Forward) and Andrew McBride (Defense). As a player-funded organization, each rostered player is responsible cover their respective costs to be on the team. These costs include: transportation, food, accommodation, uniforms, equipment and a whole host of other costs. Your donation will make it possible for numerous players to be able to participate in the 2017 European Box Lacrosse Championships. 75% of your donation will go directly to the 2017 Indoor National team. The remaining 25% of this fundraiser will help fund the 2018 Men’s National Team who will be competing at the 2018 World Lacrosse Championships. Donations originating in the USA are tax-deductible. Click here.